Boxer Michael Ayittey popularly known as Ayittey Powers once again failed to adhere to the rules of the boxing federation, this time around fighting comedian Baba Spirit. In a video circulating on social media, the two personalities are seen initially exchanging words which further escalated to a fight that had to be stopped by staff of Accra-based radio station, Accra FM. The fight, according to sources, stems from long held feud between Powers and Baba Spirit. Baba Spirit has allegedly been throwing tantrums at the boxer on Accra FM, a situation that led to the reaction by Ayittey Powers. An eyewitness account has it that the host of Accra FM’s drive time show, Black Eye, being aware of the long standing feud between Powers and Baba, invited the two men to settle the issue amicably on his show. However, his effort was in vain when tempers flew in the course of settling the dispute which forced Black Eye to sack the men from the studio; but the insults did not cease and both men eventually had to settle their dispute outside the studios of Accra FM. 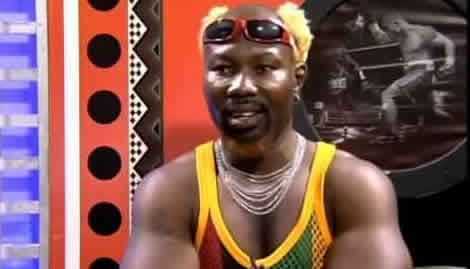 Ayittey Powers’ last boxing bout was a sixth-round knockout defeat at the hand’s of Bukom Banku.